View of the Notre Dame de Lorette chapel in the village of L’Ancienne Lorette (Our Lady of Loretto). The village is situated on the east bank of Saint Charles River, about eight miles north-west from the city of Quebec in Canada. The chapel was built in 1730 using stones taken from the Kabir Kouba River. Unfortunately the chapel was destroyed in 1862 but it was rebuilt on the same site in 1865. 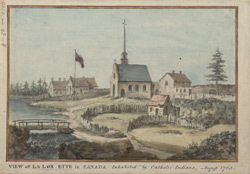 The village in the 18th century, when this print was made was home to the Huron-Wendat Indians who had settled here after being forced to move from their homeland in what is now Ontario and Quebec. During a period of exile which lasted three hundred years the Huron Wendats lived in six different sites before settling in the village of L’Ancienne Lorette.